As summer transitions into Autumn/Fall, most hotels are looking for a way to increase bookings during this historically slow period of the year. In most cases, trying to make any significant changes to an organic website to accommodate for this downtime may seem a bit overwhelming, and in many cases ineffective. Target Local Events: Check in with your local CVB and find out exactly what conventions may be coming to your area over the next few months and setup a specific AdGroups focused on the big events. Set up short term promotions for any convention that you know will have a big draw, and try to have all campaigns running at least one month before the convention start date. Don’t Forget the Family: Even though school may be back in session, there can still be quite a bit of family travel from October to December. Set up a new AdGroup specifically targeting “family hotels,” “family vacations,” or any travel destination in your area that you know is going to have a strong holiday push. Celebrate the Holidays: Believe it or not, some people do actually travel for Halloween. Combined with potential Thanksgiving and Christmas travelers, a holiday specific campaign has the potential to generate revenue for a solid three months. Try to find some “spooky” destinations for any Halloween travelers, while also providing potential “park and fly” deals for your Thanksgiving and Christmas travelers. This campaign is absolutely crucial to start ASAP as people tend to plan early when it comes to their November and December travel plans. Get Social: Take a look at your different social channels and find out exactly what your clients will be doing over the next few months. Don’t be afraid to ask questions or make any significant interactions with your clients. These open ended questions will provide great insight, and will also start generating some great activity on your social channels. Landing Pages Galore: No matter what new ad campaign you set up, it is absolutely crucial to ensure that you have fresh and relevant content waiting as a landing page. 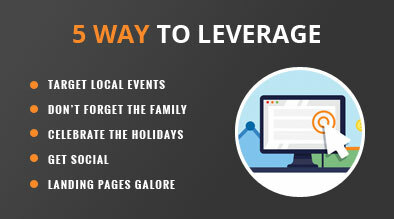 Be sure to set up new landing pages for the holiday season and link them to the appropriate AdGroup. Clicks won’t count for anything at the end of the day if you don’t have relevant content waiting for the user that would lead them to a conversion. Hotels stand to benefit significantly from these holiday ad campaigns as they present high traffic and low cost conversion opportunities. That being said, short term campaigns require constant monitoring (especially as conventions or holidays come and go) and very careful planning for a very short term window; therefore, it is important to start planning for your holiday PPC now! Thanks for checking out our most recent Holiday PPC Article! By all means you may repost the article on your website http://www.conseils-tourisme.com. Of course, i have mentioned you !